Discover the joys of cage-free parenting It's been drummed into your head: You have to make your kids turn out right. If you don't, what will people think? Worse, what disasters await if your child takes the wrong path? You try to control the outcome. You turn your home into a fortress, multiply the rules, or jump in to "fix" things the moment your teenager makes a poor choice. You wear yourself out with worry-and alienate your child to boot. The truth is that you can't make your kids turn out right. It's not even your job. In fact, your real role as a parent is much more rewarding, pleasant, and doable. Let experienced counselor and parent Tim Sanford show you how to give up your fears about your teenager's future-and the control you never really had. You'll discover the truth about how God parents His children, and it will set you free. You can turn your home from a battleground to a birthplace of freedom for you and your teen. You're about to lose control-and we think you'll like it. - Publisher Parents of teens-especially Christian ones-know only too well that many sons and daughters abandon the "straight and narrow" when they hit adulthood. The pressure on these parents to make their kids turn out right is enormous. Sometimes this pressure can lead parents to think they have to control their kids. "Losing Control and Liking It" offers parents relief of a burden they were never meant to carry and will help build family relationships based on validation and nurturing instead of control. 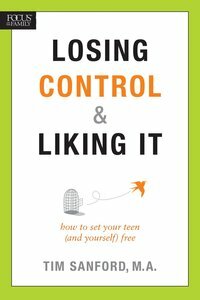 About "Losing Control & Liking It"
Parents of teens-especially Christian ones-know only too well that many sons and daughters abandon the "straight and narrow" when they hit adulthood. The pressure on these parents to make their kids turn out right is enormous. Sometimes this pressure can lead parents to think they have to control their kids. "Losing Control and Liking It" offers parents relief of a burden they were never meant to carry and will help build family relationships based on validation and nurturing instead of control.